(NaturalNews) Some House Democrats have introduced legislation that would make it illegal for civilians to protect themselves from being shot. Rep. Michael Honda, D-California, introduced a measure last summer that would prohibit the purchase, ownership or possession of enhanced body armor by civilians. The bill would have provided exceptions for those whose purchase or possession of body armor is authorized by the federal government or state governments, or the political subdivision of a state. Any purchases of said body armor prior to the passage of the law would be grandfathered and therefore not be subject to turn-in or confiscation. "There is no reason this type of armor, which is designed for warfare, should be available in our communities except for those who need it, like law enforcement," Honda said in a statement at the time he introduced his measure. "There's nothing more dangerous than what a well-armored, unstoppable active shooter can do. This bill is common-sense and long overdue." Why a measure to make Americans less safe? The measure, formally known as H.R. 5344, the "Responsible Body Armor Possession Act," was co-sponsored by Reps. Robin Kelly, D-Ill., Bill Pascrell, D-N.J., and Alcee Hastings, D-Fla. It should be noted that Hastings was a federal judge from 1979 until he was impeached for bribery and perjury in 1988. He was convicted by the U.S. Senate and removed from his position in 1989, The New American reported, making him one of just eight federal officials in U.S. history to be impeached and removed from office. He went to seek office as a member of Congress and was first elected in 1992. The news site further noted that, even if the measure would pass -- and it's not likely, given the GOP majorities in the House and Senate -- body armor is already currently regulated by the federal government. "Under 18 U.S. Code, Section 931, it is unlawful for a person to purchase, own, or possess body armor, if that person has been convicted of a felony, i.e., an offense under state law that would constitute a crime of violence," TNA reported. "An exception is made if the 'defendant' (notice that a convicted felon possessing body armor is already considered to be a 'defendant,' even if they have committed no further crimes) obtained prior written certification from his or her employer that the defendant's purchase, use, or possession of body armor was necessary for the safe performance of lawful business activity." 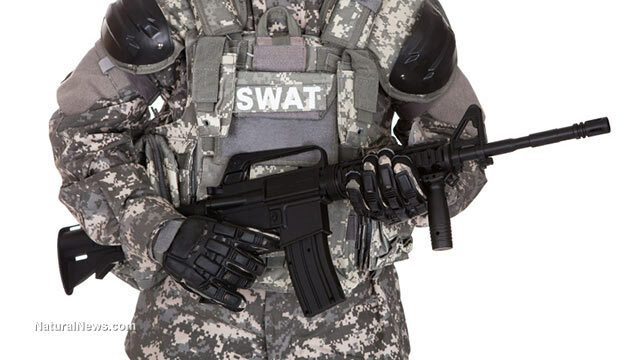 As noted by the technology news site TechDirt, the federal measure to ban body armor comes at a time when federal, state and local law enforcement is becoming more and more militarized. Yes, but who is really getting all the body armor? The site noted further that Honda's claims in justifying the measure were "bizarre," to say the least. The California legislator said his measure is designed to stop "armored assailants" that have become "a trend" in recent years. "Perhaps there wouldn't be so much armor floating around out there if we weren't distributing it to so many civilian police forces," TechDirt observed. "Not surprisingly, the very same police who have been getting much of this armor are very much in favor of making sure no one else gets it." Honda said a number of police organizations such as the California State Sheriffs' Association, the Fraternal Order of Police and the Peace Officers Research Association of California, among others, supported the measure. Again, the measure has so far been given zero consideration in the GOP-controlled House, and most assuredly there would be a coalition of concerned citizens' organizations that would lobby against its passage. But it is telling that politicians in Washington want to make it more difficult for American citizens to protect themselves.